This HDMI audio encoder allows users to combine external audio feed into existing HDMI or DVI feed or converting analog stereo or multi-channel digital surround sound input into HDMI type or simply used for replacing the original HDMI audio with different audio sound track. Users have the control and capability to select between different input audio type for conversion or encoding while the original HDMI input feed can also be automatically boosted for longer cable run through its internal HDMI repeater function. This unit is backward compatible with all DVI-D feeds through using optional DVI to HDMI adapter or adapter cable. Such combination helps users convert DVI video to HDMI output while combining additional analog/digital audio signal together into one single HDMI feed for further distribution. 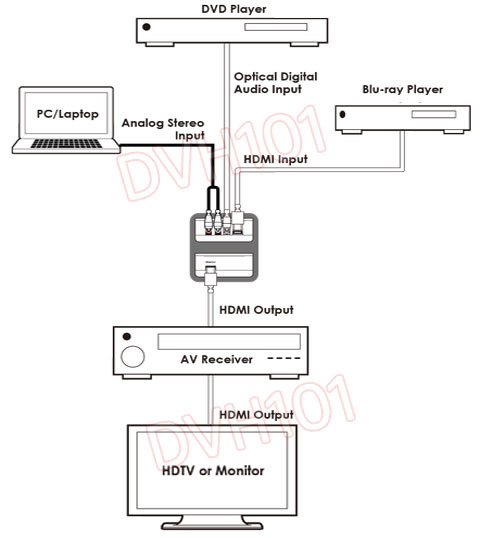 Typical application such as combining the DVI feeds from computer DVI graphic cards with audio from computer sound card into one HDMI compliant signal for display on HDTV set or HDMI monitors. The audio decoding process will be performed automatically in real time as always with no lags. All analog stereo, digital stereo or digital surround such as Dolby Digital 5.1, AC3, DTS and PCM 2-channel inputs are supported by this HDMI audio encoder. All analog stereo, digital stereo or digital surround such as Dolby Digital 5.1, AC3, DTS and PCM 2-channel inputs are supported by this HDMI audio encoder. 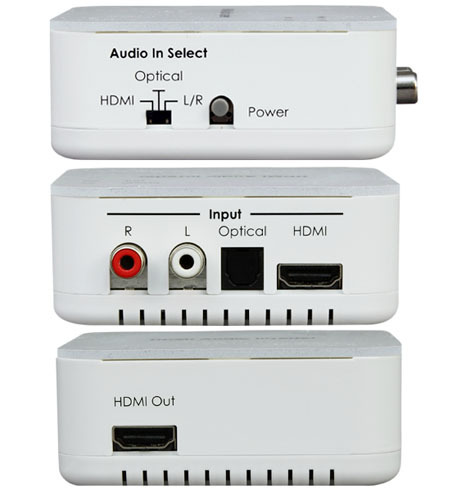 This HDMI audio injector is featured with easy dip switch design. Users can manually control and select the type of source audio channel to be embedded or converted through the DIP switch on the unit. This device supports HDMI audio sampling rate up to 192 kHz with optical audio input sampling rate up to 48 kHz. The HDMI repeater function provided by this HDMI audio encoder can automatically equalize and compensate for HDMI signal loss and also extends the cable reach to maximum distance with the same signal quality maintained all the way. Maximum input and output HDMI cable extension range can be up to 15m/50ft for 1080p with 8-bit transmission or 10m/32ft for 1080p with 12-bit transmission. Filter out the original digital audio embedded in HDMI signal with new audio channel injected or mixing with different audio type/format. Add any analog stereo or multi-channel surround sound into HDMI feed for new HDMI output. Must-have digital video adapter for accommodating DVI video devices with your existing HDMI setup for streamlined operation and setup. Encode new audio sound to DVI/HDMI feed for new output. Combine and convert DVI video with separate audio feed for HDMI output. Real-time audio decoding with no lags. Encoding optical audio of PCM 2-CH, Dolby Digital 5.1, DTS 5.1 type input to HDMI audio for output. Encoding analog stereo L/R input to HDMI audio for output. Maximum input and output HDMI extension range can be up to 15m/ 50ft for 1080p with 8-bit transmission or 10m/ 32ft for 1080p with 12-bit transmission.